I’m a photographer, storyteller, and flower-loving Francophile based in Paris, France. Find me wandering the streets of the city of light with my film camera (named Norman), looking for pastries! That, or sitting in the Jardin de Tuileries, basking it all in. I believe that love is "revealing the beauty of another person to themselves," and I can’t wait to meet you! Telling joyful, elegant stories for the creative, the dreamer, and the traveller. Being a Francophile; taking long strolls; my sunflower obsession; eating whole pints of ice cream (in one go! ); having read Pride and Prejudice nine times; my love for Audrey Hepburn; and my ardent adoration of Minions. I am a portrait & lifestyle photographer and writer, telling stories for the creative, the daydreamer, and the traveller by making joyful, dreamy images. Whether you’re defining your personal brand or just capturing some sweet memories in this glorious city...I think we’d be a great match if you love to laugh; chase the sunrise; are down for spontaneous adventures; like to play dress-up; and eat ice cream for breakfast. I’m a photographer and full-time flâneuse who eats too much ice cream and buys too many flowers. After graduating university, I bought a one-way ticket to Paris to follow my dreams...and I’m so glad you’re here! Everyone’s got one, and everyone’s is unfinished. What you put in the pages is up to you. My philosophy isn’t about taking photographs. It’s about making them. You know the pictures you look back on to remember? The ones that make you smile, ear-to-ear. Photographs are memories, portrayals of self. They deserve to be made, and that’s what we’ll do, together! It’s you, me (behind the camera! ), and la Ville Lumière! From strolls through the Jardin de Tuileries; to walks on the Seine; hot chocolates and pastries on a charming terrace; and the splendor of la Tour Eiffel, I’ll help you tell your story in the Paris you’ve been dreaming about. Please inquire for special projects. My photography style is joyful, dreamy, light-filled, and romantic — with a pop of color. I love natural light, a good laugh, and the timeless elegance that Paris lends to each shot. And, there will be flowers. Lots and lots of flowers. I love photographs that capture the confidence and beauty of my clients who are writing a part of their stories in this wonderful city. So it goes without saying that I’ll do my best to make you laugh—while finding your best angle and making you feel at ease, so that these images capture your story. Drop a note to reserve a date, or to simply say, "bonjour!". Your message has been sent. i can't wait to meet you! Paris strolls; looking for the best croissant; plenty of flowers; stories; and other adventures. I hope you'll come along and see my Paris! 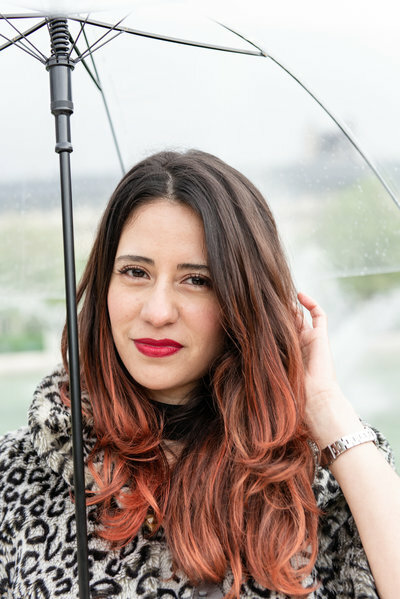 Portrait & lifestyle photographer; writer; and flâneuse in Paris, France. Click here to catch up on the latest stories from the Paris Journal.